As a design team member of Buttons Galore & More, we had a fab time during our last BLOG HOP that we just needed to do another blog hop, but this time for Glue Dots!!!!! Now when you think of Glue Dots you think, well what can you do with glue dots, but you know there is definitely a lot do with Glue Dots. I normally use glue dots to place my ribbon when I'm working with ribbon and lace, but for this project I actually used them for my pictures as well. The neat thing is that they are very safe and won't damage your pictures like other glues might. Since, the pictures I selected for this project are those of my husband's grandfather, I wanted to make sure that the adhesive did not ruin the picture, so to place my pictures down, I used Glue Dots. 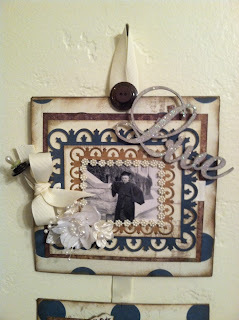 Here is what I created for this Blog Hop be sure to stop by Buttons Galore & More for more projects using Glue Dots. I started with simple 6 x 6 chipboard and I adhered a piece of Authenique Loyal Collection to both side of the chipboard. I then proceeded to distress the edges with a sanding block. Using Tim Holtz Distressing Inks I distressed the edges of the 6 x 6's. 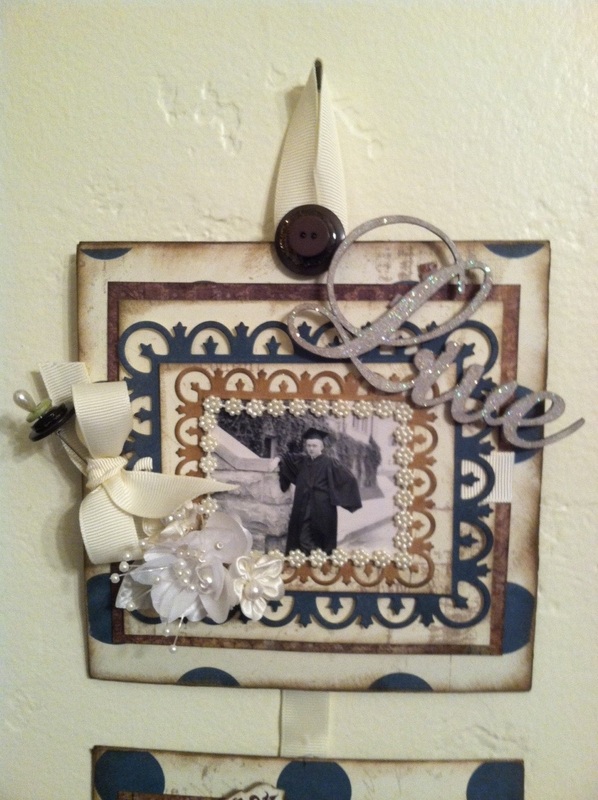 I wasn't quite sure what I wanted to create that was masculine, because I don't normally created masculine projects, but I had these awesome pictures of my husband's grandfather who at the time he may have been around 23. I love looking at vintage pictures and these pictures of his grandfather was just what I needed to complete this project. Using Glue Dots I adhered the picture to Spellbinder frame and added the beads. I then took a piece of Grosgain ribbon and again using Glue Dots I adhered to the layered frame and made a bow. Want2Scrap - Fancy Chipboard "Live"
I wanted things that were masculine yet went well with my Father-in-laws home decor, because after all it will go to him this coming Father's Day, so to do that I selected Buttons Galore & More Earthtones & Greens. These buttons went very well with my Authenique Loyal Paper Collection as well, so it was very easy to select the matching buttons. Hop along to the following blogs and be sure to leave a lovely comment. Dad's going to love your gorgeous keepsake. Thanks for sharing! This makes a great keepsake in addition to wall decor! Wow, totally cool!!! Pinned it! I'm sure your father-in-law will love his present. He'll be able to see his father anytime and he can enjoy the beautiful frames that you made with love. Awesome memorabilias! It's really nice to share gifts especially to our loved ones for them to remember us.